We had a day of rain on Saturday, this was not a bad thing, we had an inch and a half which meant that there was a day to be had in the house and at this time of the year it means Jam and Jelly making and that is just what I got on with, we had also taken off two suppers of honey so this needed to be spun, this is where Rachael came into her own, I use to have another Rachael for Jam making, since having children I do not see her as much but I have a replacement that does not seem to be thinking about children this season, Rachael even stayed over so she could work longer, we got 50 pound jars of honey, these we will sell. 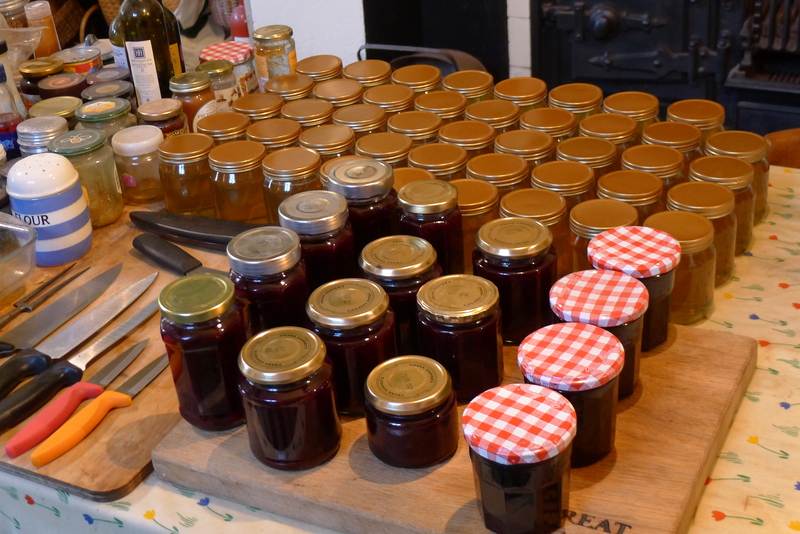 I also made Plum Jam and Redcurrent Jelly, a great long weekend for us. The major problem with putting cotton over the winter vegetables is that you have to get back onto the area at some point and that is just what we had to do, so the cotton is broken but the area is weeded and I have also used some bug clear, the white butterfly are so bad this year, we would rather not use anything but if we do do not we will have no crop this winter. 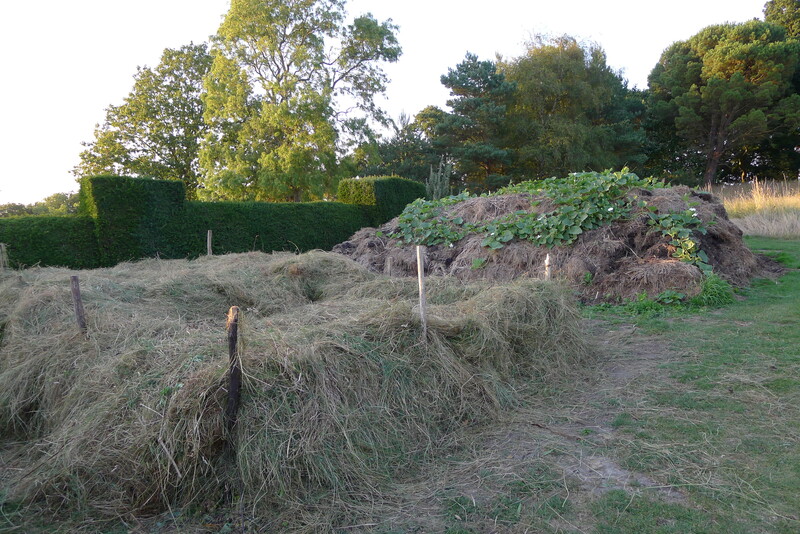 A new compost heap is born this time every year and today was the day it really started here, the meadow cutting started on Friday and today the meadow either side of the front path was cut, in three years time if my body has not given out I will be winter digging it into the soil. Bumble-Bees and Grass Snakes will nest in it between now and then and a very large population of Spiders will use it. 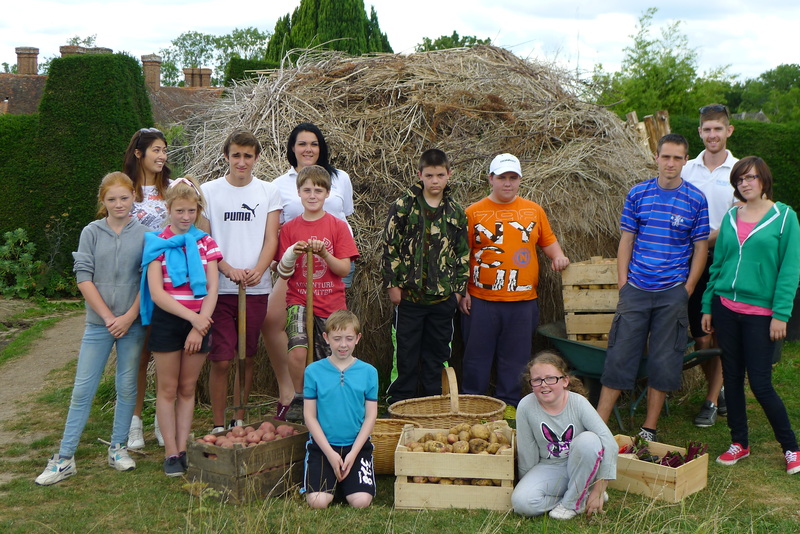 We have the charity ‘Faces of Kent’ here, a group of young cares having two nights away from their lives, a group that I really have great feeling for, these young people do so much to help their families and people they live with, we at Dixter love to offer them a break from their normal lives, I had them helping me up in the vegetable garden, we lifted the trial Potatoes from Thompson and Morgan and Potato ‘Picasso’, which we are baking for lunch. 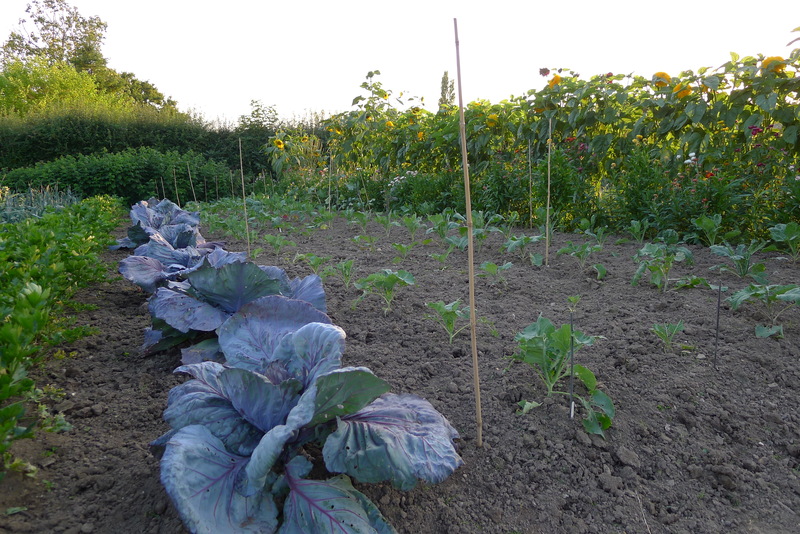 They also helped me to pick the vegetables to sell at the front door, it is great to have such help. 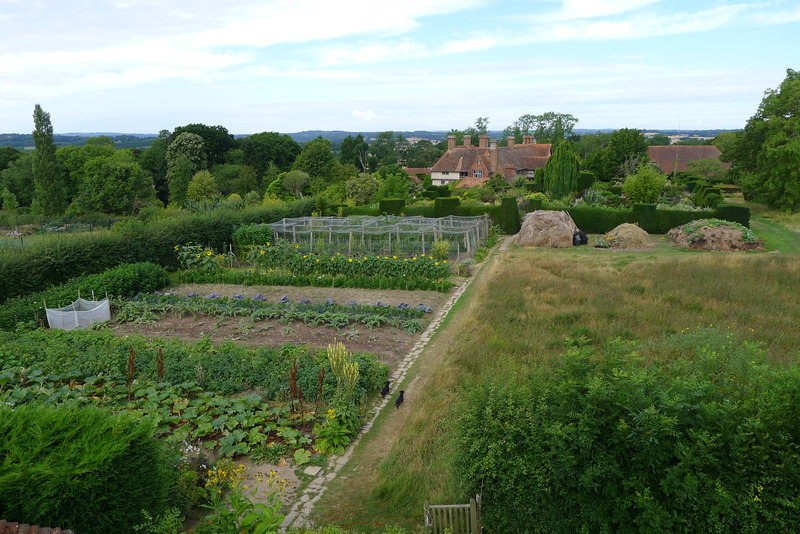 It is sometimes good to stand back and look at things, to just have the time to take it all in, well I looked down on my garden the other day which was a great thing to be able to do, Mrs Next-door has scaffolding up on her gardeners cottage so I climbed it to be able to look over the garden. Here are how things are looking. It is also good to see my sweet little dogs in it. 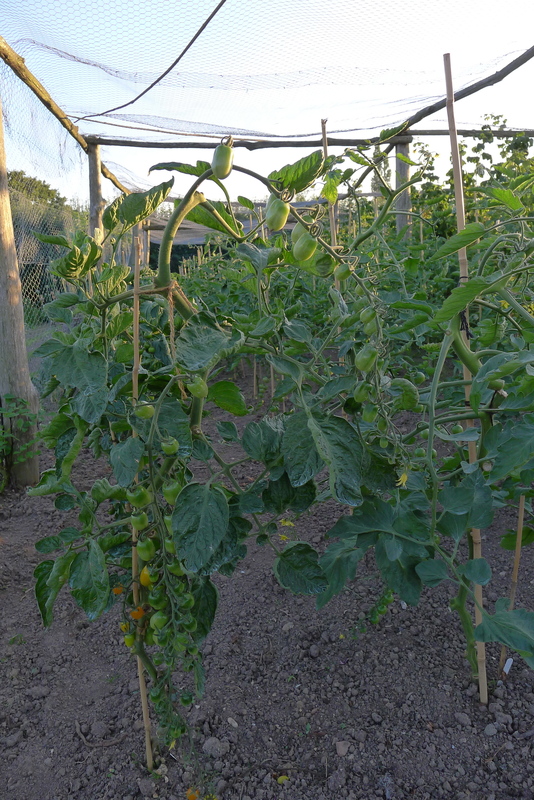 We have cleaned up the Tomato plants, I have given them legs by cutting off the lower leaves and any leaves that cover the fruit, also weeded the area in the hope they do not get any problems, Perry came up and had a look, we felt it would be better for them to have good air getting through the crop, the area looks so much better for it. I now need to get some water on them. We have had another day of cutting back and getting rid of things, today it was the cutting back of the Mustard ‘Spicy Green’, it was a great salad crop mixer but them it ran to seed, we cut the seed off but the leaves lost there mild taste and become too strong and hairy, not something you want in your mouth. 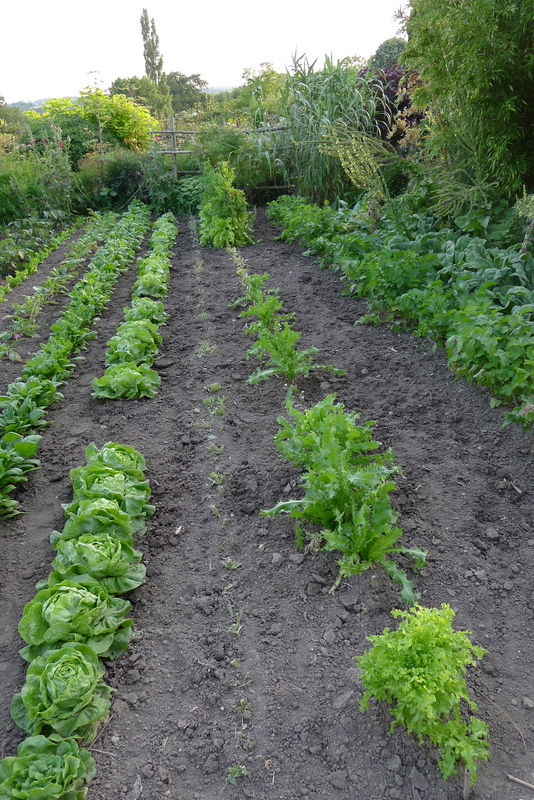 I have also been cutting back the All Season Salad, it almost starts to regrow the next day. It was time to pull out the Salad Green ‘Green Cress’, I cut it back last week which it hated so today I put it on the compost and will not grow it again, it did not give enough of a crop to give space to, grow things that are going to work for you and you enjoy, like lovers.